Uttar Pradesh's Bundelkhand region has been devastated by drought and other adverse weather conditions over the past four years. Madhaiya Anghela village in Madhogarh sub-division of Jalaun district exhibits the typical symptoms farm-related livelihoods are in tatters. Villagers say the kharif crop this year is only 20 per cent of normal years. 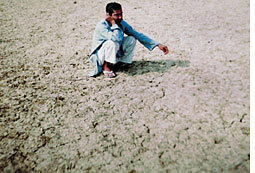 The prospects for the rabi crop are very dim--the soil has little to no moisture. There is widespread hunger and malnutrition in most villages of Bundelkhand. Pulses and vegetables are a rare sight in the diet. Most families make do with roti and chutney, or worse still, roti and salt. Several families do not get enough of even this. The farms of poor families are typically close to the ravines, adding to difficulties in cultivation.A large number of people have already migrated, and many others are preparing to migrate to Delhi, Mumbai and towns in Gujarat--to look for csula labour in hazardous conditions. This sad story gets repeated in village after distressed village. And then there is Lachmanpura. The barren landscape gives way to green fields. The people in this village of small dalit farmers say this greenery is a symbol of a wider change--farm productivity, income, nutrition and health have improved in recent times. "We had a good crop this kharif season and the prospects for the rabi crop are looking good. In fact, a few villagers have taken a third crop of vegetables," says Mahendra, a farmer. Gyanwati, a resident of Lachmanpura, says, "With better farm productivity in recent years, we get better nutrition, which in turn means fewer illnesses. There is no distress migration in our village." The turnaround in Lachmanpura owes a lot to the local voluntary organization Parmarth's resources management project. Over the past five years, the village has witnessed soil and water conservation works, bunds, and check dams. After these public works, the village has taken the assistance of a government scheme to get Rs 1 lakh for tube wells; four of these have been sunk. Women's committees spearheaded several of these efforts. Parmarth has emphasized low-cost technologies that protect the ecology, like composting. 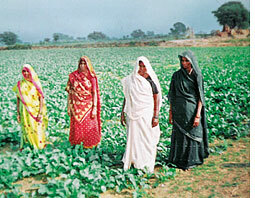 People have been encouraged to avoid chemical pesticides. Easy availability of seeds to needy farmers has saved several of them from turning to borrowing from moneylenders. Farmers have been encouraged to use bullocks instead of tractors. Because fodder from crop residue is now abundant, animal husbandry is in better shape; livestock population has increased 30 per cent. Some poor families have been provided goats. Parmarth has established a revolving fund which helps small peasants avoid distress crop sales. The mobilization of villagers as a part of this project seems to have increased solidarity, leading to spin-off benefits. Small farmer have started pooling their crops and taking them to bigger markets, where they stand a better chance of obtaining higher prices. Parmarth is also working in two other villages in Jalaun district Kadampur and Chotiber. A recent study of theirs found the per acre production of gram in the three villages increased from 300 kg to 450 kg over three years. The production of arhar (red gram) increased from 250 kg to 425 kg in the same period. The per acre income increased by Rs 1,000. The increase in income in a 180-hectare (ha) stretch in the three villages was almost Rs 5 lakh. Soil and water conservation has bought 8 ha of hitherto uncultivated land under the plough. These statistics cover only a part of the project area the annual increase in farm income in the three villages is likely to be around Rs 9 lakh. Similar efforts have succeeded in Manikpur block of Chitrakoot district. Here another voluntary group, Akhil Bhartiya Samaj Seva Sansthan, has carried out soil and water conservation work. It has constructed check dams, repaired tanks and dug up new ones. These have provided relief to people, particularly Kol tribals, in times of acute water scarcity.